Even though Fall is quickly approaching on the calendar, I’m still holding on to as much of summer (namely the summer produce) as I can. The weather also seems to share my same feelings with the current heat wave in Southern California and a lot of the country. When heat waves come to town, that means hydration, fans and cooking without using a whole lot of heat. 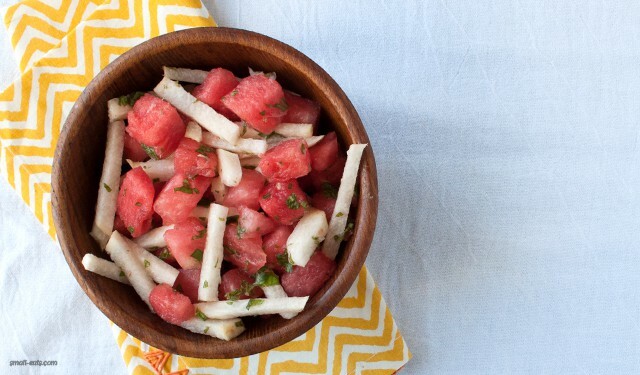 This Watermelon Mint Jicama Salad is perfect for heat waves. Best enjoyed cold, this salad cools you off, is quick to put together, requires no heat and is perfectly summery. And! (as if there weren’t already enough things to get excited about) this salad can also help you stay hydrated! Watermelon is 92% water, meaning the more you enjoy, the more hydrated you will be. Jicama, for those of you unfamiliar to it, is a root vegetable native to Mexico. It’s fairly easy to find in your regular grocery store. If you can’t find it there, you’ll definitely find some in a Mexican or Latin market. They look like big turnips with a papery brown skin. Once you peel the skin (a must), you’ll see a white root inside that has the consistency of a crisp apple. It’s perfect raw, like in this salad and gives the salad a great crunch. 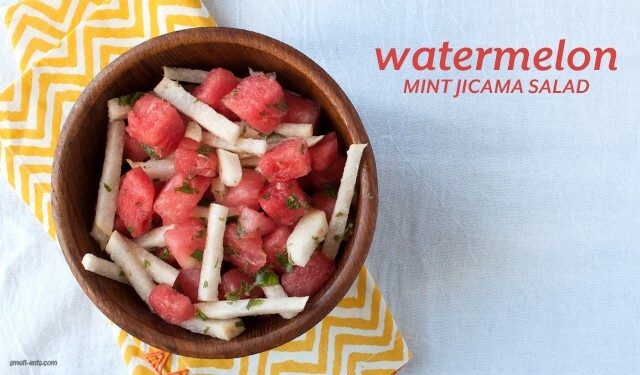 Jicama’s also high in fiber, low in calories and a good source of vitamin C.
Adding mint is a fun way to add flavor and some green to this salad, but it’s not the only variation you take with the salad. For those of you who eat dairy, you can also try a more traditional approach and add finely cubed or crumbled cojita cheese to this salad. Cojita is a Mexican cheese that’s had most of the liquid strained out of it and is pretty firm. Cojita’s subtle saltiness adds a great counterpoint to the sweet of the watermelon and the tang of the lime juice. You can find cojita in your local grocery store or in a Mexican or Latin market. Variation or no, enjoy our final days of summer and the great produce it has to offer. In a large mixing bowl, combine watermelon and mint. Cut off the top and bottom of the jicama. Peel off skin with a vegetable peeler and discard. Cut the jicama into quarter-inch slices, then cut the slices into match sticks. If you have a tall matchstick (over 2, 2 1/2 inches), consider cutting them in half again for easier eating. Add the jicama into the mixing bowl. Squeeze the lime juice over the ingredients and stir to combine. Add cayenne (if desired) and add more lime juice if you want a punchier salad. Serve immediately or chill before serving. Best enjoyed within a day or so.